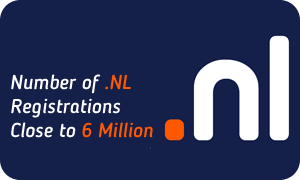 The Dutch country code domain .NL is approaching 6 million domain name registrations, according to the .NL registry. As of March 2015, 5 556 691 .NL domain names have been registered. The .NL extension has enjoyed great popularity across the world since 2003 and is currently the third largest ccTLD following .DE. (15 million registrations) and .CO.UK (10 million registrations). The number of registrations in 2014 grew by 2.7 % in comparison to the year 2013. According to the current statistics, 21% of households in the Netherlands hold at least one .NL domain and 83% of companies in the country have a website. Furthermore, 2.4% of .NL domains, which constitute about 130 000 websites, are used to facilitate e-commerce sites. The .NL namespace is safeguarded via DSS system introduced by the .NL registry last year. The system has been designed to monitor the registration system and alert domain holders of registrations closely resembling their brand names. At the end of 2014 the total number of domain registrations worldwide was about 289 million among which 5,5 million were domain names under .NL. Currently the country code domain of the Netherlands ranks number eight on the global list of all TLDs. If you are interested in registering a .NL domain name, please use our search tool to check if the name you are looking for is available. For assistance, please do not hesitate to write to our Support Team at support@web-solutions.eu.